Not the tidiest of the earthstars but one of the smallest, the Dwarf Earthstar is found in mature sand dune systems where broken sea shells raise the alkalinity of the sandy soil. Very occasionally you may also come across this species on chalk-rich sandy soil well away from the coast. 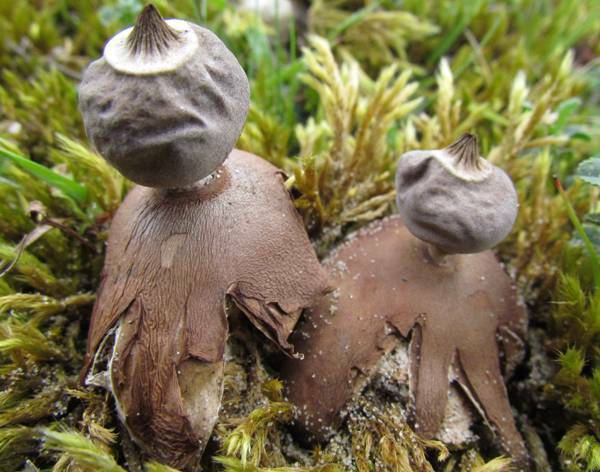 Like other earthstars, Geastrum schmidelii is a gregarious little fungus and usually occurs in colonies, sometimes with several dozen fruitbodies crowded together. From mid summer through to winter and often into the following spring the Dwarf Earthstar can be seen in Britain mainly restricted to coastal sand dunes in England and Wales, although it has been recorded also in Scotland and Ireland. 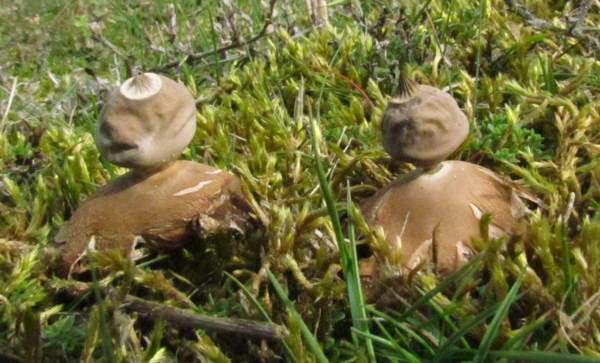 This earthstar occurs in other coastal parts of mainland Europe from Scandinavia down to the Mediterranean region, and it has also been recorded in Asia and North America.. The Dwarf Earthstar was described scientifically in 1842 by Italian mycologist Carlo Vittadini (1800 - 1865), who gave it the binomial scientific name Geastrum schmidelii by which it is generally known today. 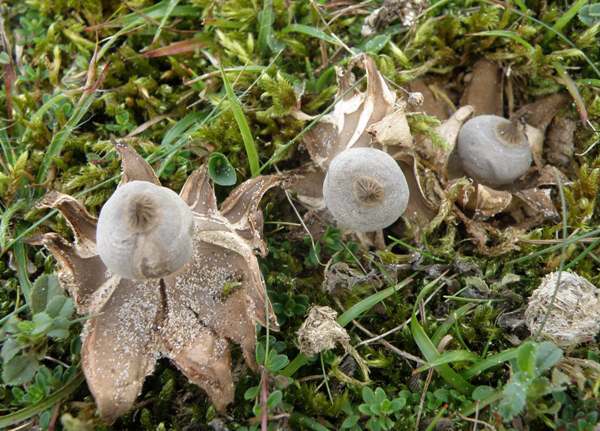 Earlier, in 1809, Christiaan Hendrik Persoon had named this species Geastrum nanum - invalid as a basionym because that specific epithet had already been used. Geastrum, the generic name, comes from Geo- meaning earth, and -astrum meaning a star. Earthstar it is, then. The specific epithet schmidelii honours German physician and botanist Casimir Christoph Schmidel (1718 - 1791). The mouth of the inner peridium is sharply beaked with striate sides, and the beak is surrounded by a pale annulus on the top of the inner peridium. 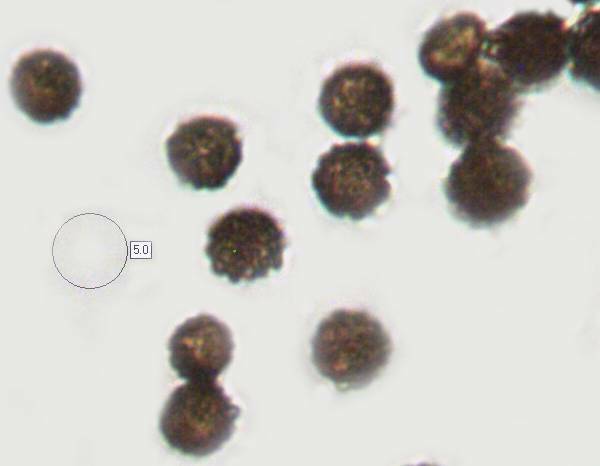 Spherical, 4-5.5µm; ornamented by many small spiny warts. Mainly found in alkaline sand-dune slacks. Fruiting in the autumn; long lasting, and sometimes remaining intact throughout the winter months and in to the following spring. 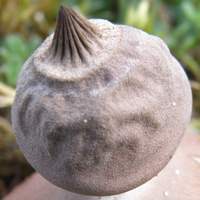 Several other Geastrum species are of the same general form, and confident identification requires experience. Geastrum minimum is similar in size and form and it also occurs in sand dune systems. Known as the Tiny Earthstar, it is very rare and has beenreported only from a couple of locations on the Norfolk Coast. Earthstars are inedible and have no culinary value, but when dried they can make attractive table decorations as long as they do not get mistaken for pepper shakers! Ellis JB, Ellis MB. (1990). Fungi without Gills (Hymenomycetes and Gasteromycetes): an Identification Handbook. London: Chapman and Hall. ISBN 0-412-36970-2. Hansen L. & H. Knudsen (1997), Nordic Macromycetes, Vol. 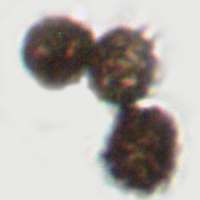 3, Heterobasidioid, aphyllophoroid and gasteromycetoid basidiomycetes, Kopenhagen.